Endecocide have been invited to be one of the initiating organisations of the Charter of Brussels,published on January 30th in the European Parliament, calling for the establishment of an international court to try crimes against the environment, such as Ecocide. This is the next logical step on a journey towards a world without Ecocide. The Charter calls for a progressive approach towards effective legal sanctions for environmental damages. Supporting and further strengthening the idea of a Moral Criminal Court for environmental crimes and offences. This Charter will be submitted to Ban Ki-Moon, the Secretary-General of the United Nations this coming September. Endecocide made a strategy and action plan and will be focusing from now till September on the petition to the European Parliament, to demonstrate continued citizens’ demand for the law of ecocide prevention, as well as the Charter of Brussels, working closely with our international partners to establish an international court of the environment. 25 years ago, an International Criminal Court was unthinkable, but due to strong commitment from Human Rights organisations it happened. Today, an International Environmental Criminal Court might seem unthinkable, but if we continue to show the public’s support, it can happen! Endecocide want your help! 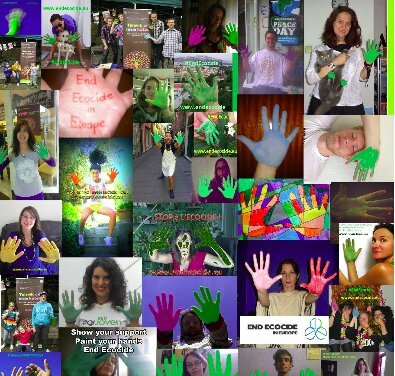 Let’s End Ecocide together!! Every hand helps! We will continue to collect signatures for calling on the EU Parliament to create a law against Ecocide, sign the petition here which will be submitted at the end of September 2014. This entry was posted in International News and tagged Ban Ki-Moon, Charter of Brussels, Endecocide, European Criminal Court of the Environment and Health, International Criminal Court, International Criminal Court of the Environment and Health, the Secretary-General of the United Nations by tamesidegreens. Bookmark the permalink.